Suter Planners have been appointed as the lead consultant to undertake the Goodwood Oval / Millswood Sporting Complex Improvement Plan. Having over 20 years’ experience in the industry, particularly in developing plans for similar facilities, Council are confident they will do an excellent job. The consultants have commenced work reviewing relevant documentation and it is foreseen that consultation will commence in mid-February, with the final plan completed by June 2014. There will be plenty of opportunities regarding ways to get involved and provide feedback. For those of you who are continually annoyed by the train tooting it's horn every time it enters or leaves a station or at pedestrian crossings the following article has been sent to me. Just click on the link below to read. This year we had 1500 riders which include 9 tandem teams (with a vision impaired rider (called stokers)). Preliminary projections indicated that RLC will be able to donate all of the riders entrance fee to the two nominated charities, the Board and Charities have conducted additional activities (Dinner and film viewings) to raise additional funds to cover the costs of the event this year. We have received a number of emails from riders this year proclaiming that it is the best ride and coordinated event. The also mention logistically how good it is to start and finish in the same area. I would like to thank all of your staff involved in the years event. Their contributions help significantly with the organising and coordination of the event. In particular, the assistance of John Wilkinson and Carly Smith. A big thanks also needs to be go to Michael Howley on the day, he came to the oval and solved a few issues. Thanks to the Council for your continuing support. This DPA has the potential to change the listing for most houses in Black Forest and those in Clarence Park west of Goodwood Rd. I will ensure that the consultation is well done in these areas and I (probably with Don but I haven't discussed it with him yet) will door knock those properties most affected to ensure you are adequately informed. Many of you will love the proposed changes that will allow more intense development of your properties and others will not. You should take the time to express your view either way. The significant changes are generally north of Forest Ave and south of Dryden Rd. In the last few days a petition has been presented to Steph Key, Member for Ashford, about the noise emanating from the East Ave rail crossing. This petition contained over 50 signatures all from the immediate area. This morning channel 10 and 7 attended the Victoria St crossing to hear Vicki Chapman, Shadow DPTI Minister, announce that the Liberal party would ensure the pedestrian warning signals would be turned down (but still at a safe level) at all locations if they win government in March. The petition recently collected in that locality was presented to Vicki, hopefully, she will ensure both Warren Truss and ARTC get a copy. Seems like a long time since the meeting in December. The break has left us with a long Agenda that took until midnight to debate. 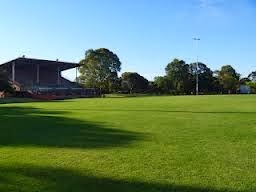 Unley Oval Redevelopment Investigations; I was pretty surprised when reading the papers that went with this as I feel they do not address the intent of the motion that Cr Palmer put last year. The report asked that it simply be received as there is no money in the budget or future budget estimates. The report spends little time discussing what has been described as sub-standard facilities other than to say that "while not fully compliant with the SANFL Guidelines they are not generally too far away from preferred standards..." The cost is then described as $1.6 million with the benefit being almost entirely for the Sturt Football Club. Other proposed changes include increasing open space, fencing, moving the oval 10m north and resurfacing the playing area. 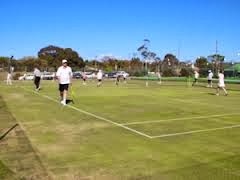 The Council agreed to receive the report and to workshop a way forward, this is most likely to include an upgrade of the Sturt Football Club facilities. Funding would still need to be external for works to proceed. Low Impact Telecommunications Facilities Locations in Unley; This from Cr Tipper, it will be good to see her back at Council after her period of leave.PASSED. It seems if we don't remember where they are then we don't know how many we have. This record may enable better lobbying in the future which could lead to better regulation. The information debated should be made available soon to the public. The ceremony this morning for Unley's new citizens was , once again, heart warming. The ceremony was followed by the celebration for the recipients of the Unley Citizen of the Year. The main recipient was Kevin Cameron for his work with the Unley band. The Youth of Year was Michelle Ewers and the Event of the Year Affordable Gardening Kits. It was great to see a nomination from our community for the hard work Ray Broomhill has done for the Good Residents Action Group. Thanks to the vigilance of a resident many of the cumquat trees in the planters on Goodwwod Rd have been saved from dying of thirst. While many did die those that survived now appear to be thriving. Planters are placed where traders have asked them to be, are planted by Council and are to be looked after by the trader. Except in time this is lost in history and everybody assumes it is not their responsibility and just sits back and watches them die. This time Council has ensued they were watered but it was too late for many. Council are currently in discussion with the Goody patch team to see if they can take responsibility for their care and for replanting. The Jan 2013 Newsletter has been (or will be) distributed this weekend. Don does south of the railway line and I do north. Please take the time to read the newsletter and to get in touch if you have any concerns or things I should know about and can make a difference to. Also take the time, if you can, to discuss the content with your neighbours and encourage them to take a greater interest in Local Government. I can send the newsletter electronically if you wish so it is easier to share. Happy Australia Day. There was an increase in sponsors and a number of new wine outlets this year, as over 20,00 people attended it was very well patronised and yet better layout of events and more seating opportunities made it appear less crowded and more relaxed. 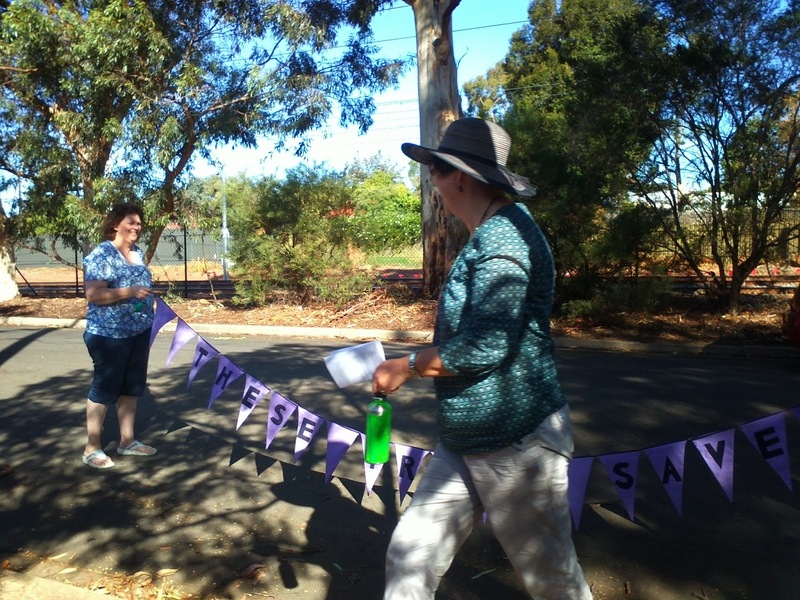 The money spent by Council on this event has so far been supported by our ratepayer. Well done to the staff for making it happen. The race start this morning was also a great even although I didn't get there; I attended the funeral of a well know resident who I met through the Clarence Park Community Centre Board. Dudley Wilson was an inspirational resident and it was pleasure to have known him. Despite repeated requests by residents that the noise being made by the pedestrian warning signals at the Fairfax Ave rail crossing nothing had been done since last November when they were installed. Well something had been done and that was clearly explained in a letter, from an empolyee, sent to residents and published on the DPTI website (see earlier bog). This letter said essentially that everything that could be done had been done and what existed was what was going to be!! Yesterday a concerted effort by residents on talk back radio was effective and saw the noise being turned down. This morning Tom Koutsantonis, tried to explain his way out of the fact that direct action had been effective. He claimed he had been to the site before Christmas and that these things take time, not once did he even answer emails or phone calls from residents. Hopefully , this solution will be long term and give residents some peace of mind. However, it highlights the poor communication between DPTI and residents once again. 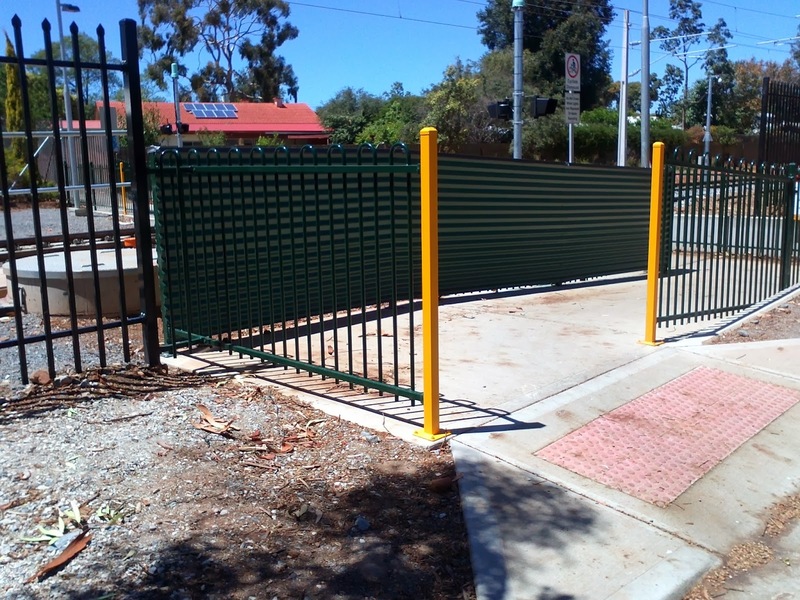 Why couldn't residents have been treated with respect before the devices were installed to find a solution that ensured the safety of crossing users and was acceptable to residents? Why also are staff not acting quickly on Ministerial or CEO requests and promises when asked to do so? This, of course, fits well with the views of almost everyone in Goodwood South. This tree grew just outside my classroom.it appeared to be a beautiful, healthy tree. Last weekend my visual assessment was proved quite wrong. 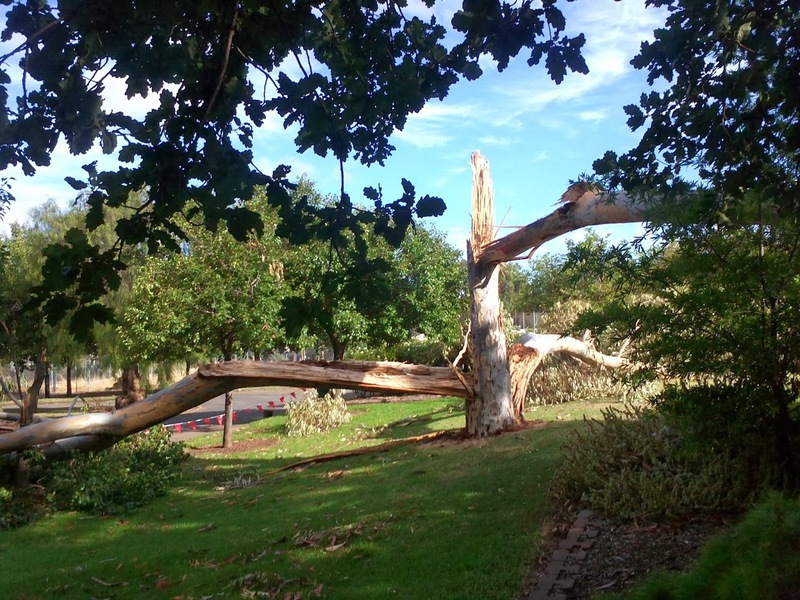 The tree first spit away from the foreground and then in the next wind the remainder split in two.The limb on the left fell where students often sit and enjoy their breaks.The site has now been cleaned up. The entire centre of the tree had been eaten out but white ants. The Swimming Centre set two attendance records during Adelaide’s intense heat wave period. 5279 patrons visited the centre during the five days, a record for five consecutive days, since the centres refurbishment in 2004. The largest daily attendance figure since 2004 was also recorded. 1719 patrons from the local and extended community visited the centre on Tuesday 14/1 when the temperature peaked at 45.1 degrees. Monday received the second highest attendance figure for the week with 1536 patrons. The staff, under extreme conditions did a fantastic job controlling large crowds and ensuring patron safety with no major incidents occurring. The centre increased its service on the first three days of the heatwave to close at 8:45pm. This to enable the community extended opportunity to cool off. The extended sessions did not occur on Thursday or Friday for the safety and well being of staff. These attendance figures coincide with a capacity VACSWIM program. 403 children (believed to be the largest in the state) attended the centre for the annual water safety initiative. I hope the weather remains favourable for the rest of the season with a late, hot, extended summer predicted. This time I felt that we were closer to getting an undertaking from the Liberals that may help to fix some of these problems if they are elected in March. Time to have your say again!! On Monday 20th January Council will be commencing our community engagement in regards to the Regional Public Health and Wellbeing Plan that we are undertaking in collaboration with the City of Mitcham. Planning environments for physical activity and accessibility for all. 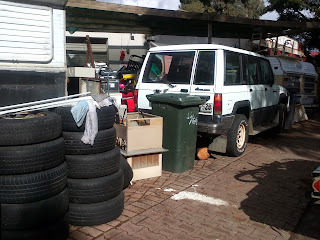 · Preparing for the public health impacts of climate change and bushfire and flood emergencies. · Planning for intergenerational population mix. · Engaging business in promoting healthy lifestyles. · Engaging with people who work full-time. · Opportunities for planning and partnerships with community agencies and the aged care and education sectors. · Strengthening the role of community centres and libraries. · Community ownership of the heath agenda including healthy eating and a clean and green environment. · Exploring shared service opportunities for environmental health protection. The results of this engagement initiative will be considered and incorporated in the development of the draft Strategy, which is due to be presented to Council in March 2014. · What does a healthy community mean to you? · What do you consider to be the community health and wellbeing priorities for the region? · What other key issues or opportunities would you like reflected in the Health and Wellbeing Plan? · Do you have any other ideas or comments about improving community health and wellbeing in the region? The online forum also includes extensive information regarding the consultation and the project, frequently asked questions, key dates, 3 quick polls (on maintaining healthy lifestyle, place of residence and perceptions of current levels of health). There is also a document library which includes the flyer, a copy of the feedback form and a link to the State Health Plan. The celebration yesterday and the flag raising was a celebration of community spirit. While many things are still on my list for DPTI to complete this one has been won by the residents. The 100 year old trees will be there for a long time to come. Approx 20-30 people attended. Thanks to Mary for making the flags, they look great and , hopefully, they will be in place as a community reminder that team work does pay off. The event was also attended by Step Key, Member for Ashford, who has spent much time and effort as well trying to get better outcomes for the Community. Thanks also to Rhonda who has been th force behind the achievment. I would like to confirm that I have booked the Millswood Bowling Club for tomorrow evening at 5:30pm for a community meeting with Vickie Chapman, MP. Please feel free to forward on the invitation to other who may be interested in attending. This is perfect viewing preparation for the main race. 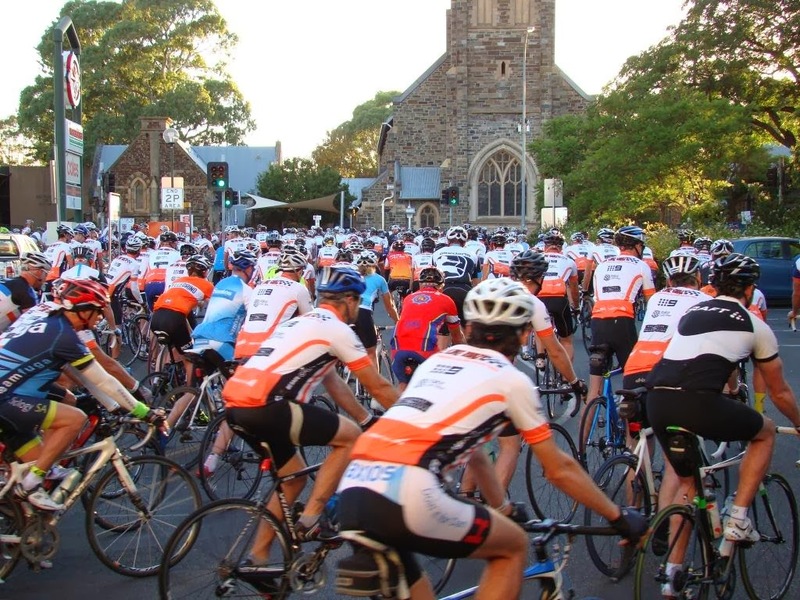 Be there to watch as thousands of cycling enthusiasts launch from Unley on the official tour route to Victor Harbor. Come and be a part of the millions of spectators globally as the crème de la crème of the world’s professional cyclists begin Stage 4 action of the Santos Tour Down Under. Click here for a list of street closures and parking restrictions. 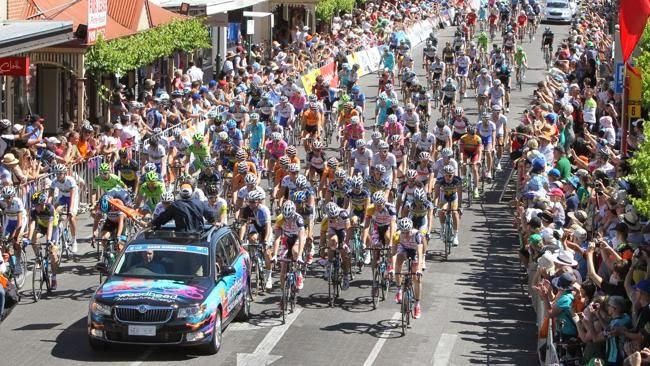 On the evening before the Santos Tour Down Under races, the Unley Gourmet Gala will kick off at 4pm. King William Road, renowned for its fashion and food, is set to come alive during one of the biggest celebrations on the Adelaide calendar. 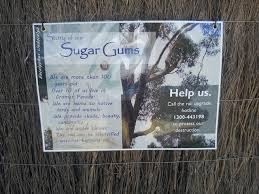 Sunday afternoon (19th Jan) residents have been asked to meet together to celebrate the saving of the sugar gums in Cromer Pde (near Fairfax Ave). There will be a celebratory flag raising at 5:30 pm. The City of Unley has engaged Complete Urban to undertake a public lighting audit. The lighting audit will involve staff from Complete Urban walking through the City’s streets recording information on electronic devices and taking photographs. It is anticipated that the Complete Urban staff will be begin the audit in January and conclude in February 2014. If you have any further queries please contact Council’s project officer, Matthew Sanderson on 8372 5468. Good to see that this project has begun after being funded in the 2013/14 budget. Currently council has a fixed contract for the amount that it pays for street lighting. 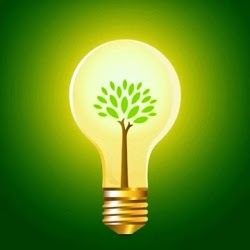 There are no savings if the lights are lit later and no additional costs if they come on a hour earlier than they need to. This has been to the frustration of many of our residents, especially those of us who are up early and find the lights are still on and it is broad daylight. Council's hope is to be able to find a way to light the streets more effectively and at a reduced cost. The lighting audit is the first step. The following letter was initially written to one resident. DPTI must have thought it was so good they would share it with everyone and posted the letter below on their website. Fairfax Avenue / Cromer Parade are required to stay in place for safety reasons. with the International Standard ISO 7731 and the volume is not required to be adjusted. offending and so the current tone was maintained. the alarms are required for the automatic activation of these gates. the Guidelines for the assessment of noise from rail infrastructure (”the Guidelines”). configuration and safety and maintenance requirements for PTS pedestrian mazes. provides the required shielding to these abutting properties. Adelaide Metro InfoLine: 1300 311 108. Well I have news for the author of this letter, this response is simply not good enough and offensive to all who can hear the beeps nearly all the time. I sat a at a meeting where you promised a sound wall in this location and a 1.2 m fence is not a sound wall. Can you please find the additional money to create an environment similar to what residents enjoyed before the project, remember, you told us that noone would be worse of? There are solutions and they need to be found quickly. You need to acknowledge that what now exists is unacceptable and genuinely consult with the people who seem to have better ideas than you do about what will work. I asked a question of the CEO this morning about what we were doing/providing for the most vulnerable in our community during the current record breaking weather. I just hope this is the hottest day ever for a very long time! The response as as follows. Well done! · Our staff will check on anyone that they are concerned about. Our libraries and community centres are open to the public and we would welcome those who are struggling with the heat. Cool filtered water is available at all those sites. At the last elector representation review Council examined the distribution and location of wards as well as the boundaries of the existing wards. After much conversation and debate with very little demonstrated interest from our Community the wards were left unchanged other than for minor boundary changes. While some changed were suggested for Goodwood South in the end the boundary was not changed. However, Council considered that the name Goodwood South did not reflect the location of the area and that it would be better named after at least one of the suburbs it encompassed. To this end Clarence Park was the name agreed to. For Don and I this means little else changes for now but when or if we choose to run for reelection we will be running in Clarence Park. All the election material you receive from the Council, the Electoral Commission and candidates will be about Clarence Park. Please take the time to watch and listen to this You Tube video posted by a resident. The speed is dangerous and the wheel squeal incredible. http://youtu.be/cn3b01OTlFk. If you are living through this now is the time to complain and to complain often. The latest claim is that oiling the track might help, then why not give it a try? Aside from the noise, resident concerns regarding speeding and the risk of accident remain high, as well the dust is potentially dangerous. I know at least one resident that has collected some of the material and is waiting to have it analysed. You may also be asked to sign a petition by one of your neighbours. While I don't generally support petitions I believe that in this instance it will bring the attention of the politicians to this issue and maybe make them realise that there are alternatives to the current situation. This year Unley is doing it a little bit differently. At 9:30am there is the usual Citizenship Ceremony for those who have expressed this wish. This will be followed by the announcement of the Australia Day Citizen of the year for Unley in the general, youth and event category. This will be held on the Village Green. All those nominated will be acknowledged and their achievements celebrated as well as the winners in each category. This will start at 11am and will be followed by a family friendly event that goes until 4pm. The event will have children's activities, lots of food stalls and some cultural dances and activities. Bring your family, friends and neighbours and enjoy the 2014 Australia Day Celebrations! 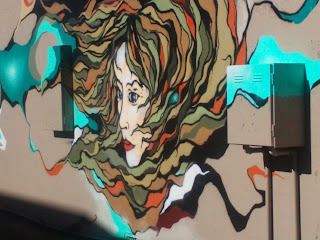 Are you passionate about public art/s in Unley? 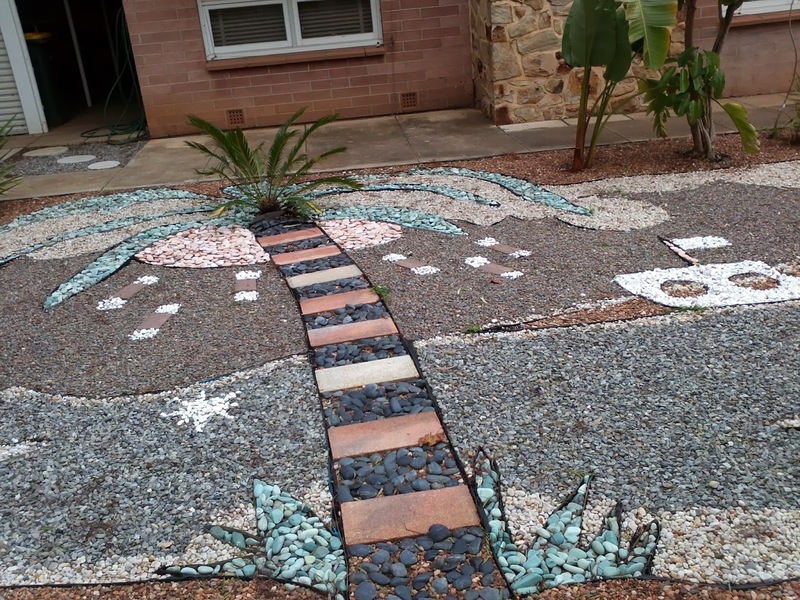 Do you think public art can deliver new ideas, culture, community and diversity in Unley? We are developing a Public Art Strategy and we want to know your views. We have several questions we would like you to answer in our online forum. We will be closing this discussion forum on 31 January 2014. And a lot less of this. What happens when you put a lamp post in the middle of a tree? Inevitably the tree loses and is removed. But why does it have to be this way? Late last year the lamp was erected in the tree (what thoughtless individual did this I don't know but I do know that with a little more thought the person may have erected the light one metre left or right and the story would be different. However, when it came time to trim the trees that were overlapping the exclusion zone along the train line this tree was ear marked for removal, even though it was no where near the zone. 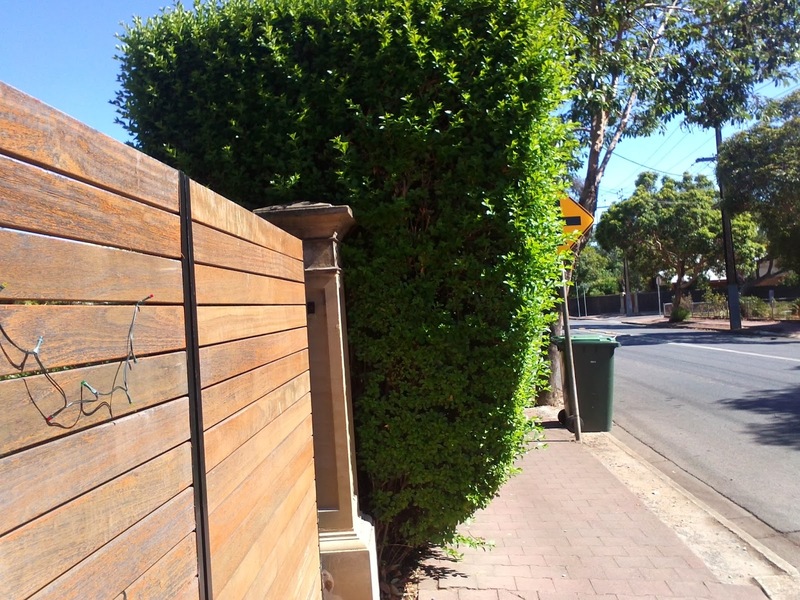 After a good fight between residents, Councillors and DPTI the tree was allowed to remain and was entered into the Unley Development Register for due process to be followed pending removal or not depending on merit. It seems some time after this the Council arborist decided the tree was unsafe and posed an unacceptable risk to those using the playground. However, despite this Council went ahead and notified residents that they had an opportunity to save the tree and asked for comments to be made to them suggesting that the Development Asesssment Panel would make the final decision. What a mess and no one to blame but Council itself. The tree has now been removed but this has given residents just one more reason to distrust Council. Thinking about the recent Consultation review is that I do know that you don't consult when there are no alternatives; you inform. If the tree had been identified originally as posing an unacceptable risk and residents who lived near by were informed while saddened by the information it would have been accepted. 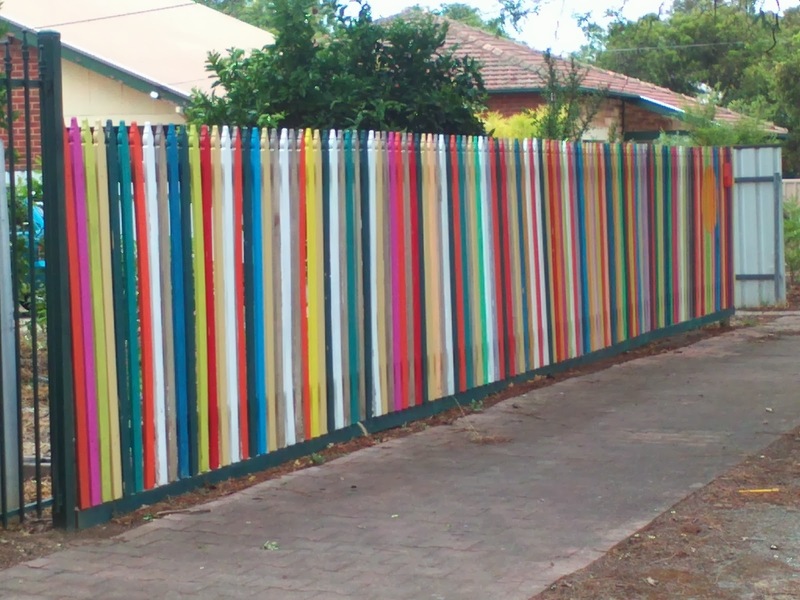 negotiate new fences at 2.1 m and shielding of cameras so they don't intrude on their privacy. However, I was disappointed that the Liberal team were not prepared, at this time, to make some promises that would see the implementation of the remediation that the current Labor government is refusing. I'm sure these will be delivered in due course. 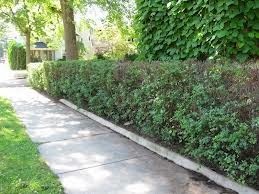 Doesn't this hedge look great? It seems likely the hedges in Goodwood South are growing more quickly than anything else at the moment and are the cause for concern for many residents. In my opinion a footpath should allow 2 people to walk side by side or for a double pusher or wheelchair. I pushed a double pusher for a couple of years when my boys were little and knew where all the hazards were. I certainly did't feel safe having to go onto the road just to get to where I wanted to be. Many hedges are so overgrown that they obstruct about 400mm of footpath, every time they are trimmed they creep a little further onto the footpath. From time to time Council needs to remind the owners of the offending hedges to trim back harder so they once again sit level with the true fence line. The public meeting on this was held last night at the Civic Centre. Given that budget meetings usually see 3 people attend I was pleased to see about 50 people ready to participate and share their views on what should be consulted and to what level should be expected. People also discussed the barriers that prevent participation and how they most likely to be inspired to participate. It came as no surprise that the more people are likely to be affected by change the higher the level of consultation they expect. As an example if the neighbors wished to build a 3 story building most people would want to know even to the extent of staff knocking on their doors. Some of the most contentious issues are small and seemingly trivial to those dealing with them and yet to those involved the effects are real and worse than annoying. I remember a few years back when Council staff decided to change the direction of the community bus; it seemed such a good idea and was if everyone wanted to go to Unley Central. However, for those using the bus just to get to Woolworths it was a disaster. This took well over a year to resolve and return to a 2 way service. You live in one of the loveliest suburbs in Adelaide. Don’t take what you enjoy for granted. 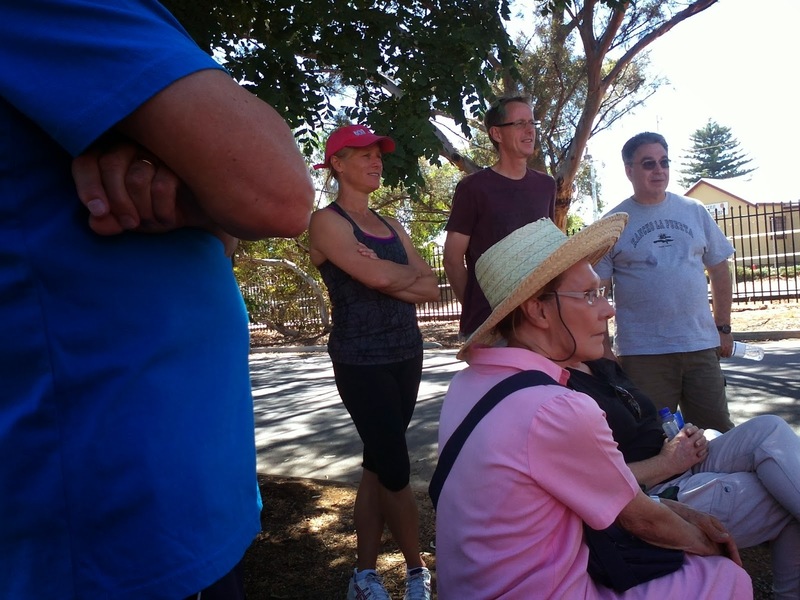 Resident voices are needed to help manage Goodwood Oval with big issues approaching that have the potential to impact on your amenity. Council is continuing to support this organisation that shares its views regarding Goodwood Oval. The recently formed Goodwood Oval Reference Group met twice late in 2013. The website for this group can be found at http://goodwoodoval.org. This group has representatives from the hockey, football, tennis and cricket organisations that play on the Goodwood Oval. However, there were insufficient nominations from residents for the group to for fill its function. Greg Willson, Mike Raphael and Glen Watson were nominated and selected to be on the group and Greg was then elected as chairperson. What the group now needs is at least 2 more residents. If this sounds like something you would like to be involved in then please let us know. Meetings are held every 3 months on the 1st Wednesday; the first meeting in 2014 is March 5th at Tennis SA. The Millswood Complex Improvement Plan (also includes Millswood Lawns) has been nominated as a worthwhile project for this year by Council. Council is presently seeking tenders from qualified organisations to undertake this work. As the recommendations that they may make may have long term impacts in the Goodwood Oval area it is really important to have more residents on the committee. You can contact Don and Jennie at the email addresses given; Greg’s email is willson.greg@gmail.com and his phone number is 0403042142 if you wish to contact him to have a chat before nominating. This week's Eastern Courier contains some words of wisdom regarding the Stormwater Management Plan. The words below belong to Paul Ashenden . "Ironically, it's this last one which attracts the least amount of attention in the public sphere but has the potential, if not dealt with, to have the most devastating consequences. About 7000 homes in the area are at risk of serious flooding yet the five councils involved and the State Government are still bickering 10 years after talks began. There were significant steps forward last year, firstly in February when the umbrella body, the Stormwater Management Authority, signed off on a $148m plan which had taken years to put together. Then, in August, West Torrens, Burnside, Unley, Mitcham and Adelaide City councils agreed to chip in a third of the cash to fund the plan. They called on the state and federal governments to find the rest of the cash but the signs aren't good they will come to the party and the deal between the councils is on the verge of falling apart. 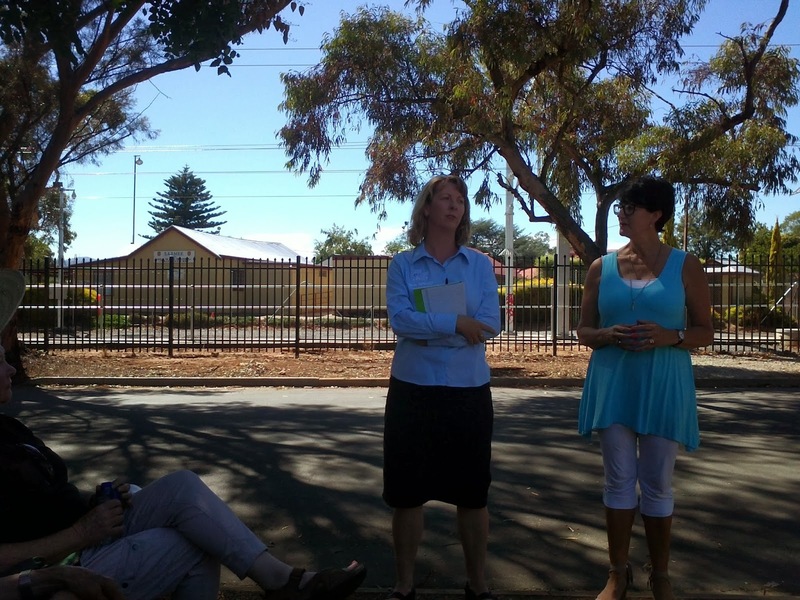 Residents in some upstream councils have vocally opposed plans to dig up streets for culverts, the building of a large dam in Brown Hill Creek remains a point of contention and West Torrens Council has threatened to go it alone if State Government funding is not forthcoming. There's no doubt it's a complicated situation. Anything involving water always is. But surely the time has come for resolution. The people living in the 7000 at-risk homes deserve it". This Saturday Terina Monteagle (candidate for Ashford) and Vicki Chapman, MP, are holding a street meeting. The principle reason for this is the complaints made to them about the sound of the audible warning at the Fairfax Ave train crossing. My memory tells me that this crossing was to be protected by a sound mitigation screen which is yet to materialize. The noise made has been recorded at 73 dB and operates every 7 minutes for up to 18 hours a day; this is causing great distress to residents. Please, have your voice heard. Vicki has asked the press to attend. 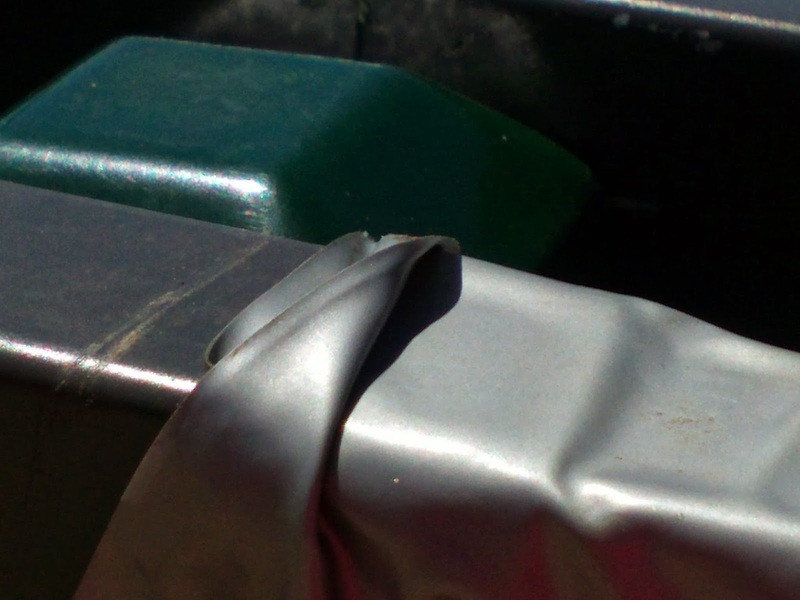 The fencing is held together with sticky tape. The Unley Gourmet Gala returns on Thursday 23 January on King William, Hyde Park. 4pm-10pm. One of Adelaide's most prestigious events, the Unley Gourmet Gala is an exciting outdoor gourmet experience showcasing some of South Australia's finest local food, wine, fashion, music and entertainment. Be entertained by cooking demonstrations from Marion Grasby, explore food and wine stalls, indulge in delicious cuisine, and enjoy fashion parades and a diverse array of live music. There’s also entertainment for the kids to ensure the whole family enjoy the evening. View the 2014 program here. Please use the above link to see if you are eligible to enroll to vote at the next Council election. Too often when I am out and about talking to people they tell me they are ineligible to vote in Council elections. The laws regarding eligibility have enabled everyone on the state and federal government electoral roll to vote for quite some time. However, if you gain your vote by owning or renting a property or business then you must register again this year , your name will be deleted from the supplementary roll if you do not. What concerns me more is that almost everyone is eligible to vote if they fill out the appropriate forms (in 2006 only 35 people in Goodwood South did this). This includes non Australian citizens who rent or are buying a property; it also includes those people who may have a vote in another Council area due to their place of residence. 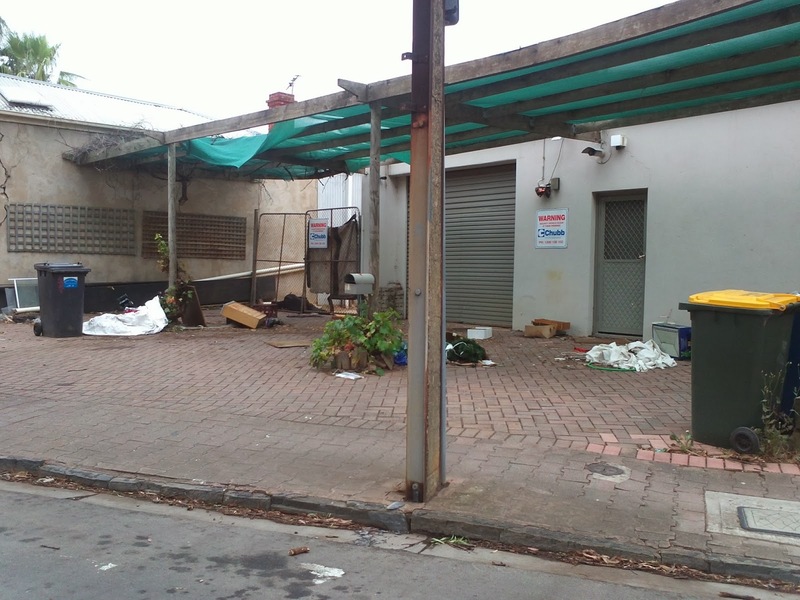 These persons are also able to gain a vote in Unley if they are landlords or business owners in Unley. What you can no longer do is to have multiple votes within one Council or one ward. I remember people bragging that they had dozens of votes in a particular Council, from memory the most multiple votes available in Unley was 33! So when I knock on your door for a chat I want you to be able to tell me that you have enrolled to vote and are looking forward to exercising your democratic right to do so. I saw an article last week on graffiti vandalism and a state government reward scheme for dobbing in a vandal if it leads to an arrest of an individual. But it got me to thinking about the problem and what works and what doesn't. We know that removing the graffiti as soon as possible after the attack is the best deterrent. 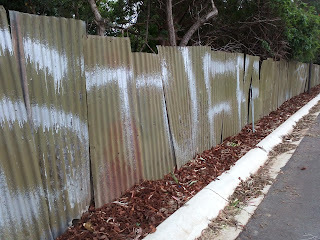 Council has a volunteer team that will paint out graffiti quickly one the location is known to Council. This is a great scheme and works well. However, in all of this the train corridors are shocking and despite repeated requests for the graffiti to be painted out to DPTI (and in the uniform colour of slate grey) the request is falling on deaf ears. 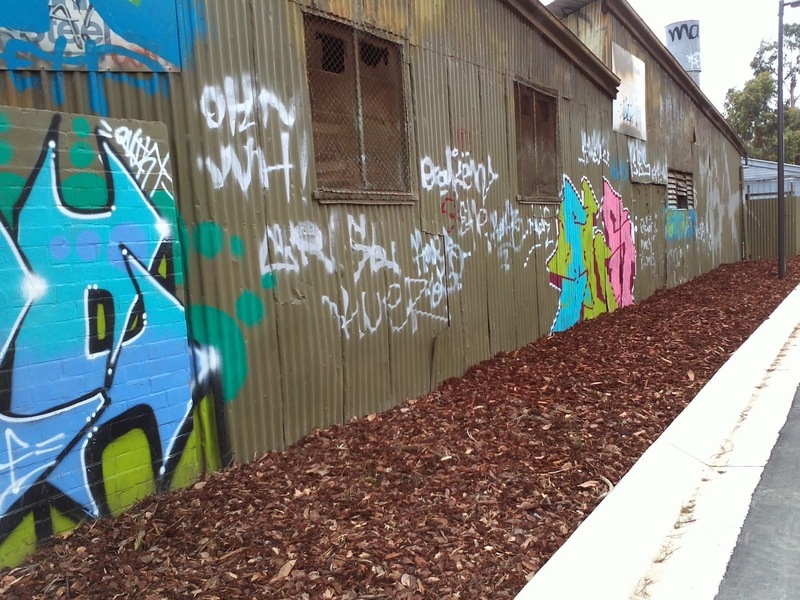 During the Community Advisory Group meetings and more recently in DPTI updates to residents the graffiti was to be removed at the end of the project. Well the trains are running (sometimes) and the graffiti remains. And who is in the paper telling us how bad this is, none other than the Attorney General, John Rau. It is well and truly time for the state government to have a good look at just who needs to lift their game! I am continually delighted by the initiative that some people take to make their homes look just that little bit different. Here are a few that lighten my heart. If you think your place ( or someone else's) is worth highlighting then send me a photo. I would love to add it. Just make sure the address is not shown or any car number plates please. 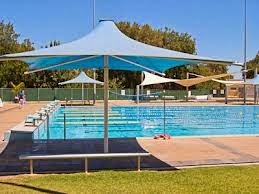 Unley Pool will again be free on Friday evenings from 5pm from Feb 7th. This initiative in 2013 saw many more people using the pool for the first time and, hopefully, they will keep coming back. Also the net loss to Council for providing this service was minimal due to additional sales at the canteen. A great initiative from Cr Hughes. The above link leads to the article in yesterdays 'The Advertiser'. While I'm sure many of the observations are true it seems to me that the obvious has been overlooked. 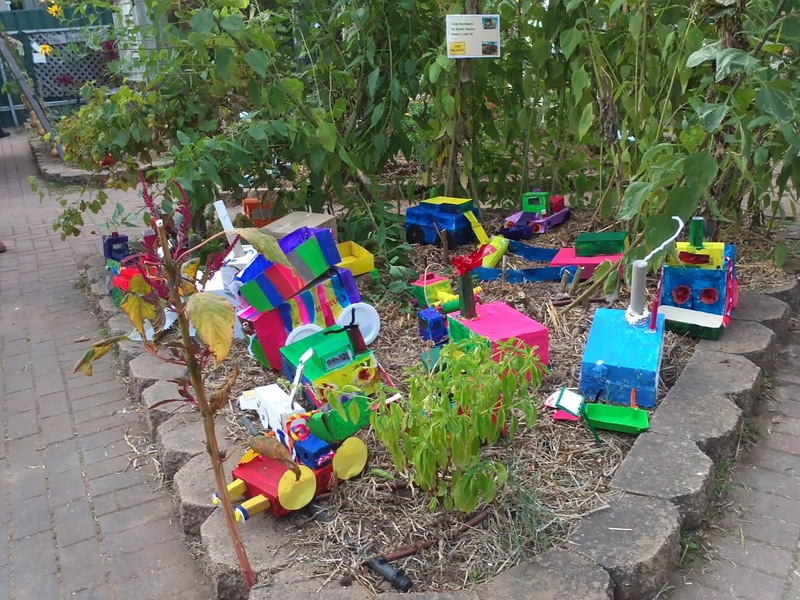 There are less new dwellings being built in Unley simply because there is less opportunity for green-fields development and fewer homes that people would wish to bulldoze and rebuild on the same site. Most people choose to live in the house they buy as they like the style of house available in the area, they may wish to improve the existing house but not to get rid of it. 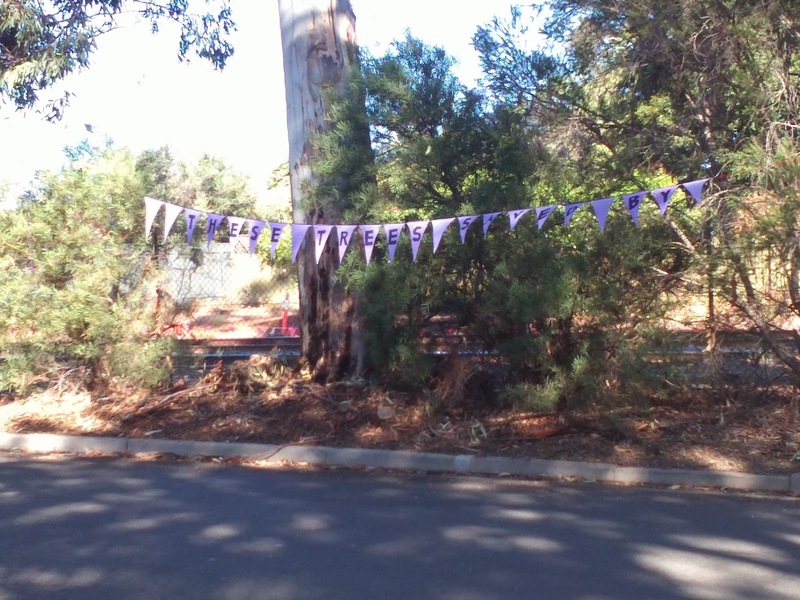 It is also true that the buy in price of potential development sites in Unley has increased to a point beyond which developers can sell at an affordable price and still make a profit. This is not about money or affluence; very few development applications put to Council are not approved and those refused are often appealed (and won) in the ERD Court. Additional to this the recent development plans approved by the Minister have allowed the development of multi-storey buildings (apartments) on both Unley and Grennhill Rds: when applications are lodged and approved to build on these sites the new home numbers should increase dramatically. The article also states that amalgamation of Councils would in some way stop this from happening; I can't see the connection. The state government continues to erode Council's planning powers and more than likely will continue to do so with or without amalgamations. If Unley were to be forced to amalgamate with another Council it would most probably be Burnside, a Council area seen to be even wealthier than Unley. The following letter will be distributed to all residents who live along the creek this week, including those residents potentially affected by the installation of culverts. For your information I moved the motion below and Cr Saies seconded the motion. This is a good step forward in keeping residents informed and in finding solutions to the flood mitigation that do not include culverts in streets. I want to take the opportunity to update you on the progress of the Brown Hill Keswick Creek Storm Water Project. 2. The final report acknowledges that many Unley residents will not accept any option that has high flow culverts in Unley streets and seeks to find a viable option that achieves this. 3. The Save Our Streets group be added to the list of special interest groups. This means that the Project Group will investigate options that do not involve high flow culverts in the streets of Unley. A number of options involve the construction of dams in Mitcham and the clearing and widening of the creek, or the combination of these. Like you, I am frustrated that the investigations have not been completed. It is essential we have all the facts before us, given the importance of this project. We expect that investigation of all options will be completed early in the New Year and all five councils will consider these options before extensive community consultation occurs. The Council and I are committed to finding the best drainage solution that protects houses and businesses in the flood plains. We will find a solution that will have the least environmental, financial and social impacts. It is not our wish to impose an unrealistic expense on ratepayers or to exacerbate disruptions in our community. Many of you have been following this site in Railway Tce. The first photo was taken several months ago, the second more recently. When I went past today the site was clear. 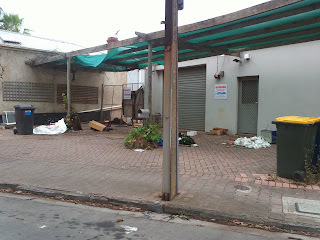 There was still some rubbish left near the tram overpass that I have asked Council to remove. I am relieved that this saga is over. It has taken a good deal of legal persuasion on behalf of Council.